According to new research from Sweden, a simple new analysis of sperm's DNA could be the key to helping involuntarily childless couples get pregnant. Parents who are struggling to conceive could benefit immensely from recent research. A team from Lund University in Sweden suggests that a simple examination of sperm can serve as the foundation for a successful assisted reproductive plan. According to the researchers, an analysis of chromosomal breaks in sperm can help in determining the best course of action for hopeful couples (see how it works in the video below). Sperm DNA Fragmentation Index (DFI), the method for analyzing sperm, can work in tandem with existing sperm analysis (like assessments of sperm quantity, motility and morphology) to offer a more thorough view of a couple's reproductive abilities. "We hope that these results will mean that involuntarily childless couples are offered the most effective treatment right away. Undergoing unsuccessful assisted reproduction can be very stressful—both physically and mentally—especially if done repeatedly," Aleksander Giwercman, M.D., Ph.D., professor at Lund University and consultant at Skí¥ne University Hospital, said in the study's release. With over 1,600 couples studied, this study is the largest of its kind thus far—it suggests that DFI's main strength lies in its ability to help couples chart out their best plans for successful reproduction. Here's what the results showed: Men with higher DFI also showed more chromosomal breaks, a characteristic that's linked to lower fertility. According to Fertility Lab Insider, the DFI score is based on the percent of cells that have sperm degradation. 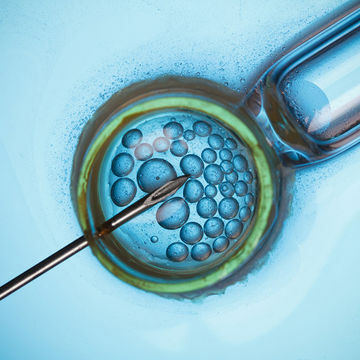 Couples who participated in this study underwent assisted reproductive therapies (either in vitro fertilization or intracytoplasmic sperm injection—ICSI.) The differences in these two therapies is key: IVF involves the combination of a harvested egg and a large quantity of sperm in a test tube; ICSI focuses on isolating a single sperm and injecting it into the egg with a needle. Men who showed higher rates of chromosomal breaks benefited most from ICSI treatments. This topic will be studied in greater detail to confirm these findings, but Dr. Giwercman plans to put his research into practice at the Reproductive Medicine Centre at Skí¥ne University Hospital. "In couples where the man had many chromosomal breaks, their best chance of becoming pregnant was to use ICSI rather than IVF. The DFI analysis thereby makes it possible to personalize treatment and increase the chances of having children", Krzysztof Oleszczuk, a Ph.D. student at Lund University and senior consultant at Skí¥ne University Hospital said.